The primary goal of Creative Diagnostics Antigen retrieval (AR) services was always to meet the needs of clinical practice, specifically to facilitate the performance of IHC on FFPE tissues and extraction of antigens/proteins from FFPE tissue. 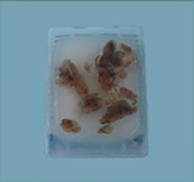 Formalin-fixed, paraffin-embedded (FFPE) tissue sections must be treated to remove the paraffin and unmask the antigen epitopes in preparation for immunohistochemistry (IHC) staining. Two methods to break the protein cross-links formed by formalin fixation are heat-induced epitope retrieval (HIER) and proteolytic-induced epitope retrieval (PIER). Unless the antigen retrieval method is stated on the antibody datasheet, the optimal method for each antigen must be found experimentally. Our scientists will help you to test several methods to find the retrieval method that gives optimal staining. Alternatively, we can combine HIER and PIER method to unmask antigens if other methods did not work. It is especially useful when performing double or triple labeling of two or more antigens simultaneously. Based on the principles of AR, Creative Diagnostics has developed a high-temperature heating protocol for antigens/protein extraction from FFPE tissue sections. Our method has improved both the protein extraction efficiency and the reversal of formaldehyde-induced protein modifications. The resulting preparation could be used either as the antigens for customs’ antibody generation, or as good materials for clinical and translational research (e.g. proteomics studies). Welcome to discuss your antigen preparation options with our expert team. We will help you to develop the optimal antigen preparation procedure to reach the best balance between yield, purity and the cost.